To evaluate microfibrillar-associated protein 4 (MFAP4) as a marker of micro- and macrovascular complications in patients with type 1 diabetes. 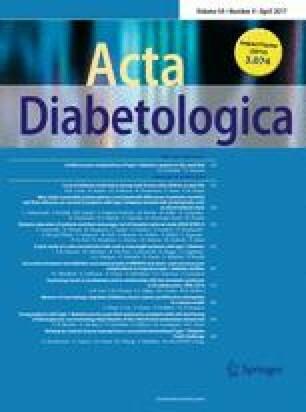 This cross-sectional study included 203 persons with a long duration of type 1 diabetes from a population-based cohort ascertained in the former Funen County, Denmark. Detection of plasma-MFAP4 (pMFAP4) was performed by the AlphaLISA Technique. Diabetic retinopathy (DR) was graded in accordance with the Early Treatment Diabetic Retinopathy Study adaptation of the modified Airlie House classification. A monofilament test was used to test for neuropathy, and nephropathy was evaluated in a single spot urine sample. Data describing macrovascular disease were obtained from the Danish National Patient Register. Median age and duration of diabetes were 58.7 and 43 years, respectively, and 61% were males. High levels of pMFAP4 were found in participants of old age, in women and in non-smokers (p < 0.05). In a multiple logistic regression model, patients with high levels of pMFAP4 were more likely to have diabetic neuropathy (OR 2.47 for quartile 4 versus quartile 1, 95% CI 1.01–6.03). No association was found between pMFAP4 and proliferative diabetic retinopathy, nephropathy or macrovascular disease. No association between pMFAP4 and macrovascular vascular complications was found. However, high levels of pMFAP4 correlated independently with diabetic neuropathy. Further studies on the predictive value of increased circulating MFAP4 in diabetic neuropathy are warranted. This study was supported by Fight for Sight, Denmark. Grant received by Jakob Grauslund (grant number not available). The funder had no involvement in study design, data collection, data analysis, manuscript preparation and/or publication decision. Søren Leer Blindbæk, Anders Green, Jakob Grauslund: None. Uffe Holmskov, Anders Schlosser, Grith L Sorensen own two patents P1389DK00 and P1183DK00 regarding MFAP4 binding antibodies blocking the interaction between MFAP4 and integrin receptors. This study was carried out in accordance with the Helsinki Declaration and Good Clinical Practice and approved by the Regional Scientific Ethical Committee for Southern Denmark. All procedures followed were in accordance with the ethical standards of the responsible committee on human experimentation (institutional and national) and with the Helsinki Declaration of 1975, as revised in 2008 (5).